In Dutch oven, cook noodles in boiling water, working in batches of about 15 noodles, about 5 minutes or just until flexible but not fully cooked. Return water to boiling before adding next batch of noodles. Drain; place noodles in single layer on paper towels. In large bowl, mix feta cheese, cottage cheese, ricotta cheese and Parmesan cheese. Stir in spinach. Spread 3 tablespoons filling down length of each noodle; roll up and place seam side down on cookie sheet. Freeze about 30 minutes. Place frozen rolls in resealable freezer plastic bags. Seal bags; freeze up to 3 months. To bake, remove 6 lasagna rolls from bag. Spray 8-inch square (2-quart) glass baking dish with cooking spray; place rolls in dish. Cover with foil; thaw in refrigerator overnight. Heat oven to 350°F. Pour 2 cups marinara sauce over rolls; sprinkle with 1 cup shredded mozzarella cheese. 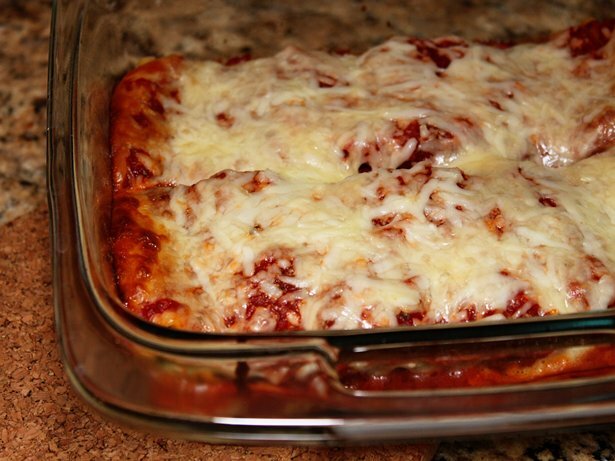 Cover; bake 35 to 40 minutes or until sauce is bubbly and cheese is melted.